When it comes to Braunschweiger, you either like it or you hate it. Personally, I love braunschweiger. I even know a few people who are “closet” Braunschweiger lovers. They would never admit to it in public but you know who you are. If you don’t think you like braunschweiger, think again. One thing you need to remember when purchasing braunschweiger, buy the good stuff! Go to your local meat market and buy it from them. You’ll immediately taste the difference. If you’re from the Midwest, you undoubtedly know of or have heard of braunschweiger. Your parents eat it and your grandparents love it! I remember going to the corner meat market with my Grandma and having the butcher behind the counter cut us a “chunk” of braunschweiger from a huge red or yellow roll. When we got home, my Grandma and I would have braunschweiger sandwiches. Thin round slices of braunschweiger on thick slices of white bread. The white bread slices have to be Mrs. Karl’s bread only per my grandma’s orders. She loved her some Mrs. Karl’s bread. 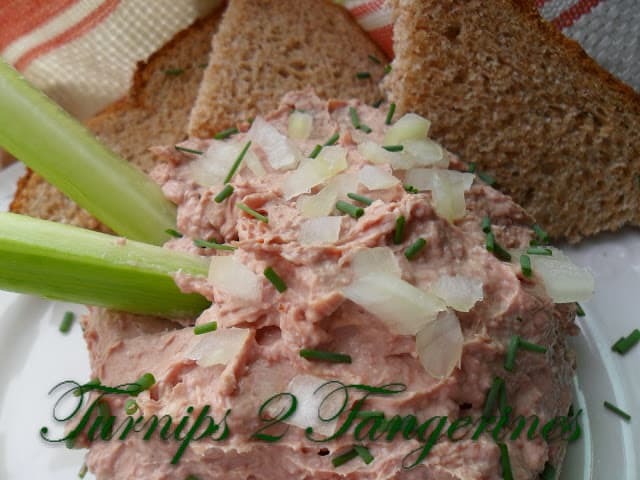 She would spread the bread with a thin layer of mayonnaise, place the braunschweiger slice on top of the mayo, then top the braunschweiger with a thin slice of Vidalia onion or a sprinkling of minced Vidalia onions. To this day, I still eat my braunschweiger sandwich this same way. What the heck is Braunschweiger? Braunschweiger, named after Braunschweig, Germany, is a type of German pork sausage, sometimes called liverwurst. Found in the deli department in grocery stores and available at most meat markets. It’s usually found between the rolls of summer sausage, bologna, thuringer and the dreaded olive “loaf.” It is soft, spreadable and nearly always smoked. Braunschweiger has a very high amount of Vitamin A, iron and protein. The meat has a very soft, spread-like texture and a distinctive spicy liver-based flavor. It’s very similar to the Nordic, leverpastej. It’s usually spread on toast but can also be used as a filling for sandwiches, often paired with stone-ground mustard, sliced tomatoes, onions and cheese. In the Midwest, braunschweiger is typically enjoyed in a sandwich with various condiments such as: ketchup, mustard, pickles, mayonnaise, and onions. In some restaurants here in Wisconsin, you can still find braunschweiger Sandwiches on the menu. Braunschweiger contains a minimum of 30% liver (pork, calf, veal, beef), binders and seasonings. Added seasonings include salt, white pepper, onion powder, and mace. 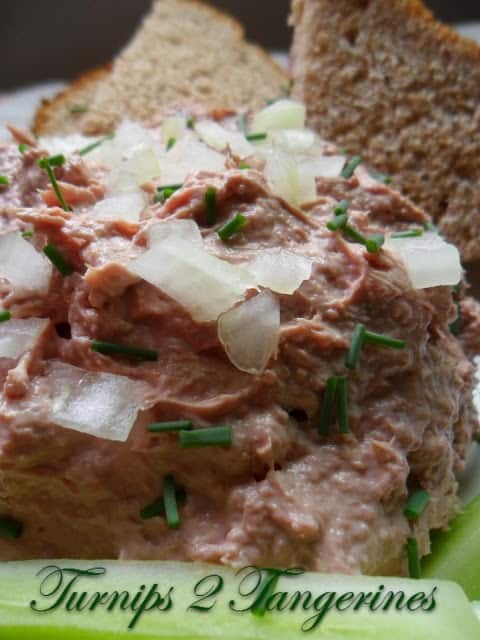 Braunschweiger can also be served as a dip or spread. When it comes to buying braunschweiger, buy the best you can find. I can’t stress this enough. Quality matters. I have noticed that men tend to devour this tasty dip. Next time you need to make a dip for a bunch of hungry guys, give this dip a try. You might be surprised at how fast it disappears. Braunschweiger Spread is a great choice to serve during football games or to send along with your significant other during hunting season. To purchase good, quality braunschweiger, stop at a German meat market. You simply can’t beat the quality and taste. Braunschweiger Spread is an old family recipe that my grandma made during the holidays. In a large bowl, beat cream cheese until creamy. Add braunschweiger; cream together. Add remaining ingredients and beat until smooth. Refrigerate for several hours before serving. Sprinkle with 2 tablespoons sliced green onions. Serve with crackers, bread and assorted veggies. *For this recipe purchase a good, quality brand braunschweiger, preferably from a German-style meat market. Hummus with Veggie Dippers is another delicious recipe to serve for your next party. I love Leverpostej, or Braunschweiger. As a matter of fact I have some in the fridge right now and I guess I'm just going to have to try this recipe. It looks yummy. Of course I usually just eat it on rye bread with some bread and butter pickles or my home-made Asier pickles. And you're right, you either love it or can't stand it. I've never heard of Braunschweiger–thanks for the lesson! I think my son would be very happy to try this spread. He loves trying new foods packed with meat! Thank you for linking! Oh yum ! 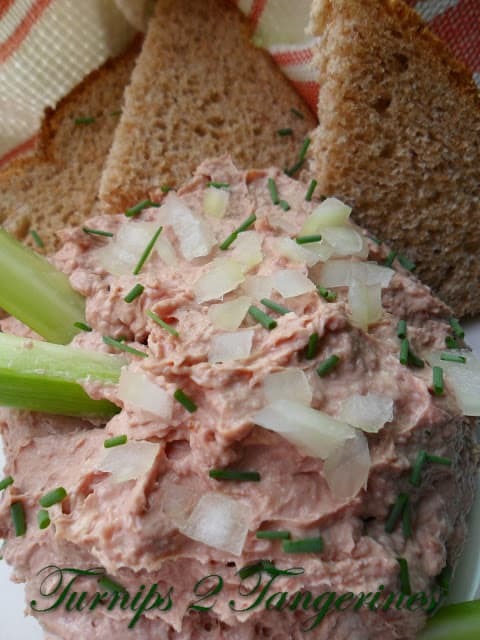 I love Liverwurst, on the other hand (Rob being brought up Mennonite) I can not do Cooked Cheese as it looks like … we will leave that unsaid. I don't like this stuff but my friend Rosie is nuts about it. I shared this on my faebook page and tagged her in the post. She will love this! Well, I've heard of this long, scary word before 🙂 But in Russia we make liver spread that looks similar. I bet your tastes delicious! Mm-Mm-YUMM!! 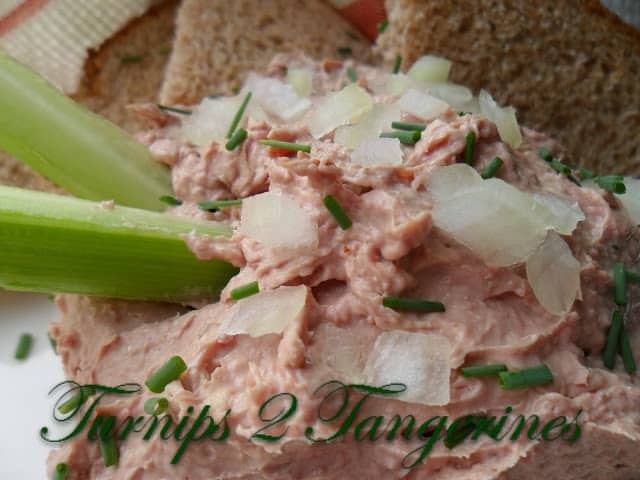 I LOVE Leberwurst (literally liver wurst) – and this is a really lovely and fresh, zingy spread! BTW I'm stopping by from "Get Him Fed #11"